I found this 1995 Virago 1100 about 5 years ago as a dropped stock Yamaha with 12,000 km on it. Since then it has changed looks twice as I get a little more "Creative". I now have it stripped down for another modification. 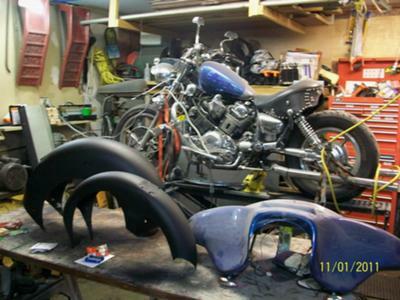 I plan on a "tail dragger"' rear fender and similar on front. I made a custom seat for a solo rider. I am installing a Batwing fairing and V&H 2" longshots down each side with 8"baffles I took off the 'Glide. Hand made polished aluminum struts will support the fenders of this 1995 Virago 1100. I have partially mocked this up last summer and now it is in for the "Final Remake" to be covered with 3 coats of HOK Brandywine Candy, some 'brushing and 3 coats of clear. Comments for 1995 Virago 1100! This looks to be an awesome build but I can't find anymore information on it. How did it turn out? If it was finished. I own a '93 Virago XV1100 and am looking to do a bagger/tail dragger, once I get used to the bike and riding again. Cool ride. You should also share it on Virago Tech Forum. Very few have done a tail dragger with one of these. Would be cool to see the progress.